James Mill was the consummate utilitarian economist and theorist: his numerous intellectual interests and practical pursuits shatter the net boundaries of modern specialist scholarship in social science.Mill's many-sided genius was primarily a product of the age in which he lived. The late eighteenth and early nineteenth centuries saw a remarkable flowering of intellectual genius in Scotland in all of the arts and sciences, which gave the country a leading place in the broad European movement known as the Enlightenment, Mill being in fact only one of many brilliant men Scotland produced at that time.Mill's writings in this volume, first published in 1966, cover his development as an economist and are an attempt to assess his contribution to classic political economy. Particular attention is paid to the formative but less well-known pre-Benthamite period of his life. The volume opens with a substantial biographical assessment of Mill's life and work. 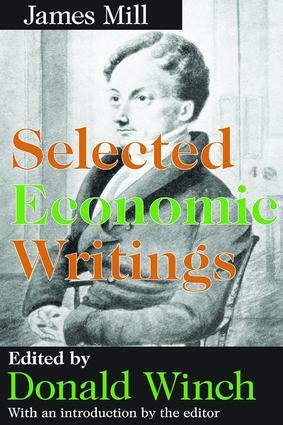 The selections are specifically divided into four groups consisting of: early economic writings (""An Essay of the Impolicy of a Bounty on the Exportation of Grain,"" ""Commerce Defended,"" and ""Smith on Money and Exchange""); James Mill and David Ricardo (""Elements of Political Economy""); Mill on scope and method (""Whether Political Economy is Useful""); and Mill and India (""History of British India""). Donald Winch provides an introduction to each section that contextualizes the essays in Mill's own work and the economic thought of the time.James Mill: Selected Economic Writings is sure to be of interest to students of economic theory and social policy. One of the founders of utilitarianism, he adopted that doctrine to both British conditions and Britain's broader imperial pursuits.Donald Winch is professor of economics at the University of Sussex. He has authored and edited many books and papers on economics, economic theory, economic policy and economic history.